The "white water" in the photo to the left is the result of storm run off from the rain we received early yesterday morning. Up till then, the water coming from the culvert was at a trickle since the snow melt had gone. The amount of water, and the force it comes out the pipe after living as a drip for weeks amazes me. 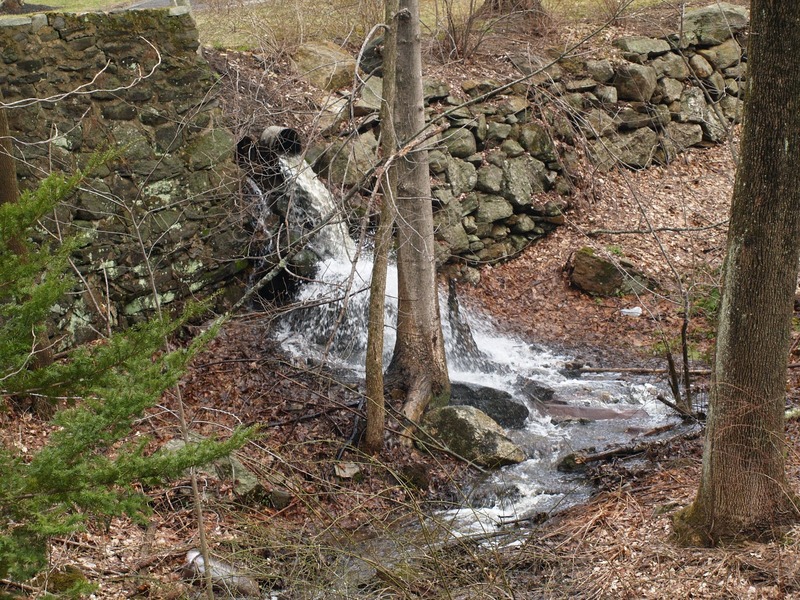 The rain water runs off the hill between Clarke Road and Brookfield Road, and fills a few small ponds. 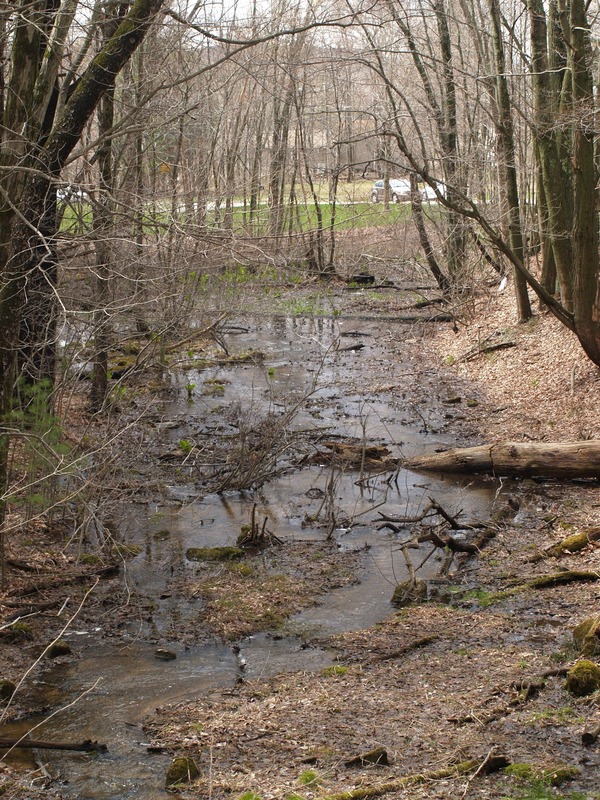 Those ponds feed each other by what the state refers to as an "intermittent stream", meaning a stream that is there, well, only intermittently. Depending on the weather, or season it will either be flowing strong, or be barely moist. Yesterday it showed it was very much alive. Years ago there was a larger pond where the culvert is now. That pond was filled in and the stream rerouted through the culverts. Filling in a pond, and rerouting a stream would not be allowed today, but years ago, it was just done if there was a reason to do it. It was a job that one would not do on a lark. 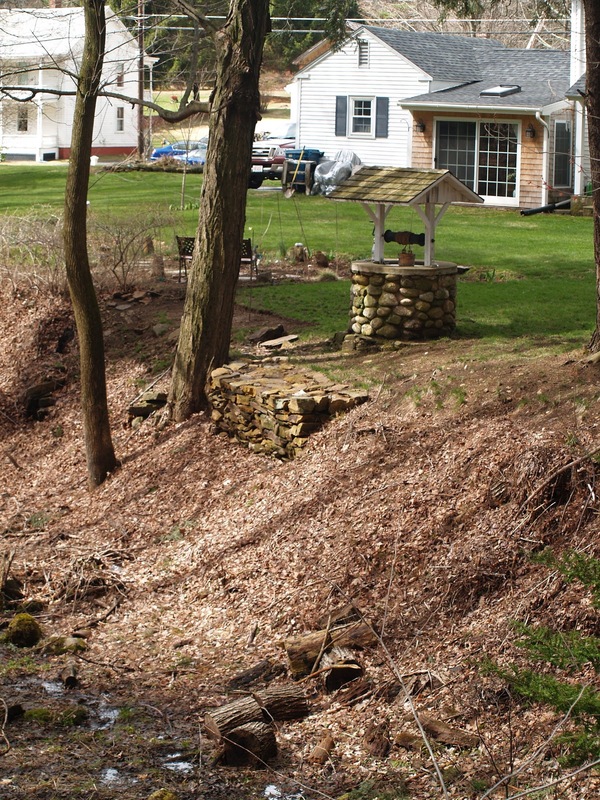 In the photo to the left the water flows from the culvert towards another culvert at Route 148 (Brookfield Road). This other culvert connects to the storm water system under the road, and where it goes from there I haven't a clue, but have been told it is the Quinebaug River at the bottom of the hill. 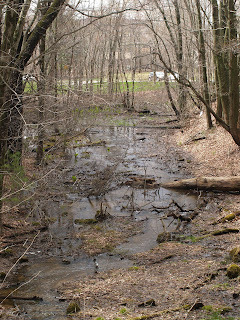 Slowly, over the few years we have lived above the stream, we have cleared out the years of neglect, and trash dumped along its edge, all the while insuring it remained a stream. An act of continual restoration. After each heavy rain I will find several old bottles that have been exposed at the top of the embankment. Most are just old liquor bottles, or shards of old pottery, and plates. The long ago practice of using ones land as a dump continued for some folks into the latter half of the last century. We feel we are only temporary owners of the land we live on. Caretakers, really, and while we are here we'll try to make right what has gone by the wayside over the years. Now, don't get me wrong, I am far from being the head of the local Sierra Club. I'm like you, just a resident of Sturbridge that enjoys where we live very much, and want to care for the people, and things around me. Besides my family this "intermittent stream" is another thing to keep an eye on, and be sure it continues to do well. I was thinking this morning how great it would be if a few more regular folks adopted some small place in town and made it there "own", and cared for it. It could be as close as the stream in their yard, or a traffic island. Nothing official, more of a casual relationship. For instance, if you spotted trash accumulating along the stone wall surrounding the Old Cemetery beside the Center School Office Building, then pick it up. Yes, I know we have a DPW that does care for the grounds, and will eventually get to it, but in the meantime, while we wait, it sits there. A simple, casual relationship with a piece of our town. Nothing too serious, those relationships can be consuming, and before you know it, you're texting each other day and night. No, something easy, and casual, and when you are done doing what ever you decide to do, you feel good, and your project looks great. Random, casual, anonymity can go a long way in this kind of relationship.